With the help of our friend, Olliver (Ollie for short), I am going to explain the differences between a Pointer and a Dalmatian. To start off, let’s look at Daisy and Ollie side by side: they are different! 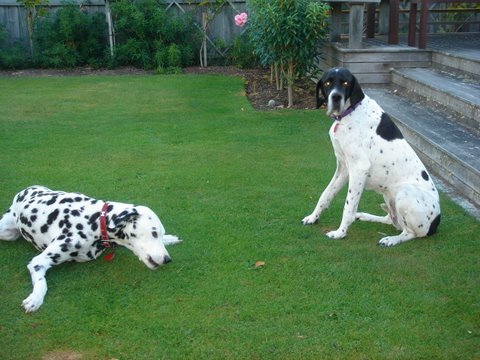 Both dogs are black & white, but Ollie has only small spots whereas Daisy has large and small ones. Daisy’s head is almost solid black; Olliver’s head has spots all over! Perhaps the best way to tell the dogs apart is to read Daisy’s lips. Our friends call these saggy doggy lips. Ollie’s lips are clearly not the same! Both dogs shed on a regular basis and are single-coated. This means that they feel the cold and so their favourite place in winter is in front of the fire. They also benefit from wearing a coat on colder days. The Dalmatian is a non-sporting dog and the breed is recognised by the American Kennel Club and the New Zealand Kennel Club, as well as many other clubs worldwide. 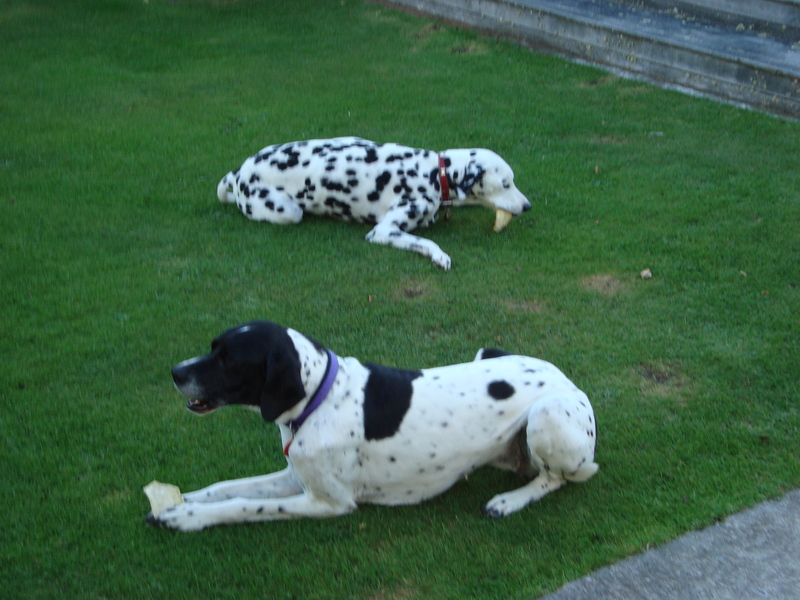 Dalmatians are either bi-coloured or tri-coloured. Bi-coloured dogs are black and white and tri-coloured dogs have brown, liver and black spots. Puppies are born white and their spots develop over time. The breed has a long history, with some people suggesting that Dalmatians were featured on the walls of the Egyptian pyramids. Gypsies that travelled Europe used Dalmatians to calm horses and provide companionship to travellers. The word ‘Dalmatian’ is derived from the area of Croatia that was known as Dalmatia. Dogs were traded for goods to the British, who were the first to breed the dogs. During the late 1700s, Dalmatians were known to be riding under the axles or alongside the carriages of their noblemen owners for the sole purpose of being a status symbol. The dogs could run or trot for over a hundred miles in a single day. In the evening, the dogs were placed alongside the horses in the stables to guard and to calm the horses. When Dalmatians came to America in 1870, they arrived as the mascot to the fire truck and this association with firehouses continues to this day. Dalmatians are known for their spots, energy, devotion, protective nature and intelligence. Like the Dalmatian, the Pointer has a long history. It was bred to be a gentleman’s hunting dog and so they are known for being gentle and well-mannered once they are trained. History records Pointers as far back as the 1600s, with Pointers being used to locate hares and greyhounds being used to chase them. The breed is thought to be a cross of Foxhound, Bloodhound, Greyhound, Newfoundland, and Setter. Other records say that there was a Spanish Pointer that was bred in 17th and 18th century to form the basis of today’s breed. Pointers are often shown ‘on point’ when they are standing still and pointing at the location of birds. Pointers are not naturally known for their retrieving skills but they can be trained to find dead or wounded game. Pointers are known for their strength, cleverness, dependability, hardworking nature, loyalty and congeniality. Sensation was one of the most famous Pointers. He was imported to the United States in 1876 and is the mascot for the Westminster Kennel Club, appearing on their emblem. The Pointer ‘on point’ is also the official registered trademark of the Rodd & Gunn clothing company and the image of the Pointer is found on all of their menswear garments. Pointer Brand clothing has also been manufactured in the United States since 1913. The company’s logo features Carolina Bill, the dog of Landon Clayton King who founded the company, L. C. King Manufacturing Company, in Tennessee. 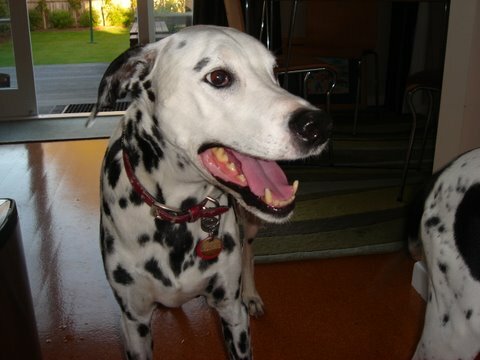 Sparky® the Fire Dog is one famous Dalmatian. He is the mascot and logo for the National Fire Protection Association. Perhaps the best known Dalmatians are Pongo, Perdita, Prince and the puppies made famous by 101 Dalmatians. The One Hundred and One Dalmatians was a novel published in 1956 by Dodie Smith that was made into animated films by Walt Disney Productions. I hope that this article gives you some better information about why Pointers are different from Dalmatians. Despite their differences, the dogs get along just fine! 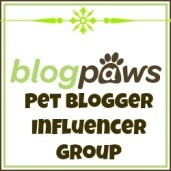 This entry was posted in dog breeds and tagged 101 Dalmatians, clothing, Dalmatian, English Pointer, fire dog, pointer, Pointer Brand, Rodd & Gunn, Sparky the Fire Dog, Sparty, Westminster Kennel Club. Bookmark the permalink. 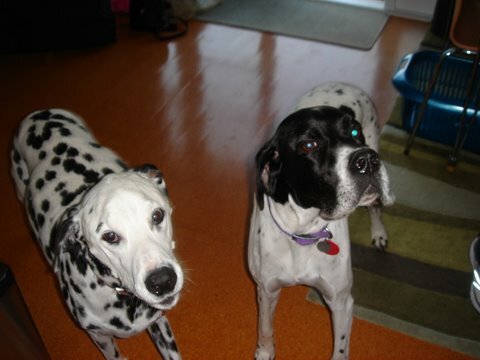 I have an english pointer named Enzo, and a dalmatian Lyla. everyone always thinks my pointer is a dalmatian lab mix. Its so annoying! 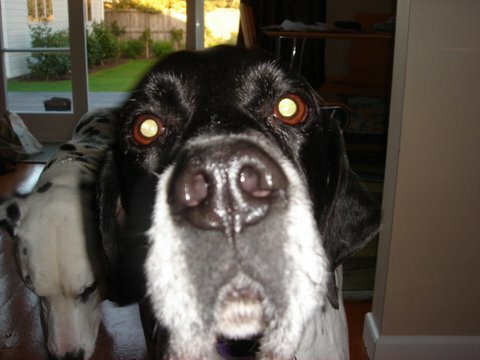 Daisy is an English Pointer and I also get annoyed when everyone sees her spots and thinks she’s a Dalmatian. 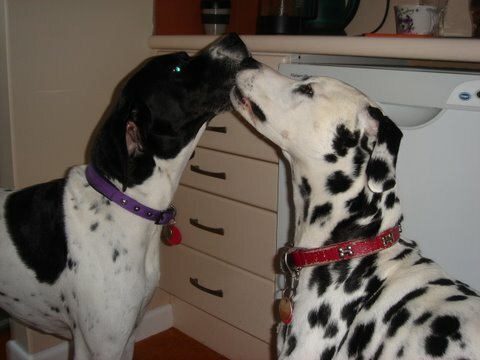 But, seriously, I love both breeds and I hold Dalmatians very close to my heart thanks to Ollie, who has now passed.